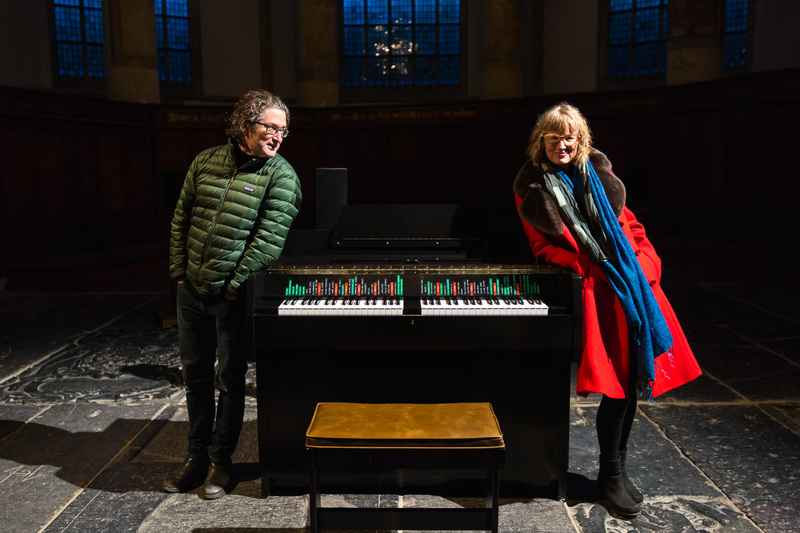 The Instrument of Troubled Dreams is a site-specific installation by Janet Cardiff (1957) and George Bures Miller (1960) that was composed in and around the Oude Kerk. A raven flies across the space; a lonely oarsman bobs up and down among the pillars of the flooded church; a boat full of people is hit by a storm off the coast; Sweelinck sits composing at the organ; a pack of bombers rushes past overhead; police search a small apartment; a Ferris wheel mounted on an inland barge drifts by. Sounds from The Instrument of Troubled Dreams,set up in the sanctuary of the church, wash over the visitors. Slowly but surely the more than seven centuries of the Oude Kerk’s existence blend with the here and now, creating a poignant moment in the consciousness of Amsterdam’s oldest building. Facing the light coming in from the east, visitors can play a so-called mellotron. The artists have converted this ancestor of the 1980s sampler into a surround stereo set with 28 speakers that redesign the space. The mellotron has 72 keys, each of them programmed to play a different sound effect, vocal track or musical fragment. The work revolves around a story specially composed for the Oude Kerk, containing spoken words and music (including Sweelinck’s, performed on the Vater-Müller organ and by the Oude Kerk’s Sweelinck Church Choir).Many of the sounds were recorded in and around the Oude Kerk in the months before the opening; the sounds of water and wind, of sailing on a large boat, a windmill’s creaking arms, and the ringing bells of the Kerk. Playing the mellotron creates a cinematic environment, and as a result those present begin to experience the church differently. Memory, preference, unpredictability and the mystery of technique all contribute to the creation of a temporary soundtrack for this space. The Oude Kerk is a site steeped in cultural history. Here, different meanings exist side by side: it is the oldest building in the city, a church as well as city archive, the last resting place of, among others, Saskia van Uylenburgh, a space of silence, a museum and a leading music platform. It is the people around the Oude Kerk who give it meaning. The Instrument of Troubled Dreams makes this principle concrete. How did the monumental architecture of the Oude Kerk inspire Janet Cardiff and George Bures Miller? Where does their fascination with the mellotron come from? And how did they select the sounds for The Instrument of Troubled Dreams? In a brand new podcast series, Cardiff and Miller talk about the origin of their sound installation The Instrument of Troubled Dreams. Radio creator Tjitske Mussche guides you in three episodes along the thinking and listening of the artists. episode 3: how do you experience the installation as a visitor? Janet Cardiff and George Bures Miller are nationally renowned installation and sound artists. Their ground-breaking work was The Dark Poolfrom 1995, which compriseda room full of bric-a-brac that made sounds and required the interaction of visitors coming through. This set the tone for following works that, rendering fragmented narratives using different media, similarly played with visitor’s expectations.Cardiff and Miller represented Canada at the Venice Biennale in 2001 and exhibited their work at venues including the Tate Modern in London (UK), the Palais de Tokyo in Paris (F), the Castello di Rivoli Museo d’Arte in Turin (IT) and the Museo Nacional Centro de Arte Reina Sofía in Madrid (S). Their work is part of internationally renowned collections in museums worldwide. The Instrument of Troubled Dreams is supported by the Amsterdams Fonds voor de Kunst (AFK), Prins Bernhard Cultuurfonds, Fonds21, Mondriaan Fund, Iona Stichting and Ludovica Stichting.